Wear Your Walking Shoes & Bring Your Appetite! On this three-hour guided walking tour, you'll discover some of the best locally owned restaurants that tend to fly under the radar unless you're truly in-the-know. You'll get to partake in multiple food and beverage samplings at four establishments, all adding up to one satisfying lunch. Between stops, your guide will share lesser-known facts about this iconic neighborhood. A welcome greeting - When you arrive at the designated meeting spot, you will be greeted by your friendly tour guide, who will be wearing a name badge for easy recognition. Your tour guide will check you in, discuss safety, and provide an overview of the tour schedule. Delicious tastings - You will visit 4 locations and enjoy 6 food & 3 beverage samplings, while also learning about the culture and historical significance of the neighborhood. 3 stops are at sit down establishments, and all 4 stops have restrooms. Local immersion - You will engage with local restaurant owners and staff, get a look behind the scenes, and eat amongst the locals. 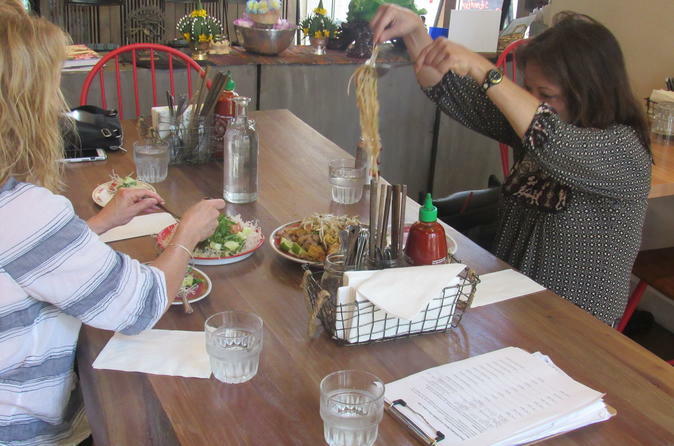 As you tour the neighborhood, you will learn about the cultural and historical significance of the area and uncover how this once under-the-radar neighborhood is becoming a well-known foodie paradise. Great service - Our local tour guides and restaurant partners provide top notch service. You will dine at 3 full-service restaurants where you have a seat at the table. Your knowledgeable guide is at your service and available to answer questions about the area and provide recommendations. At your final stop, you are free to stay and shop local artisan purveyors. After the tour, your guide can provide directions if you need them.